On the coach trip with the biddies yesterday, we passed breathtakingly beautiful countryside, through dales and moors. 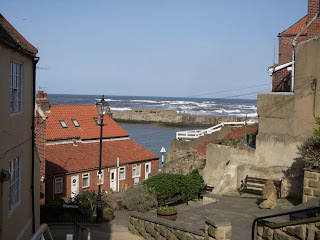 Whitby is a wonderful small fishing town and St. Hilda's is lovely. I sat on the pier and wept a little, because Grandpère was not with me, and because the place was so beautiful. He would have adored Whitby. He's never known a fishing town or village that he didn't like. 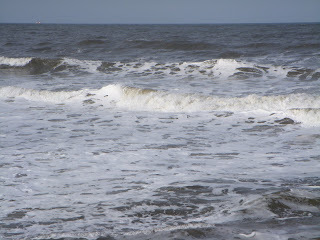 I sat on a bench on the pier and watched the waves roll in, which was soothing and healing. I'm getting all weepy and sentimental about places. I wept when I left the Yorkshire Moors with MadPriest and Mrs MadPriest. Imagine what MP thought of a weepy woman in the back of his car! The words above are from one of the few posts I wrote while I was in England. According to legend, Whitby is associated with Dracula and has a creepy feel about it, but if so, I didn't experience it. I have long wanted to have a glimpse of the North Sea, so I fulfilled two wishes when I visited, getting more than a glimpse. 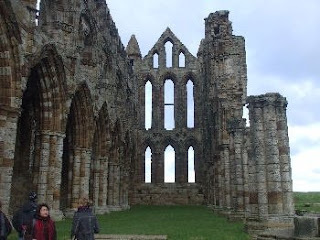 Three wishes, because I saw the beautiful ruins of St. Hilda's Abbey, which is pictured below. St. Hilda's from the pier. MadPriest told me that I had to order fish and chips in Whitby, so, of course, I obeyed. When the waitress brought my order, it was huge. The fish was as long as my forearm, and on the side was a large pile of chips. The fish was haddock, and it was delicious. The meat was thick, white and firm, but I could eat only about a third of it. Grandpère and I had fish and chips somewhere in the south of England, in Portsmouth, maybe, served from a stand wrapped in newspaper. The meal in Whitby was much tastier. Gratuitous pictures of Whitby, just because I think the scenes are pretty. On the coach trip, I sat next to a lovely lady from Wakefield. She was a widow in her 80s, and she often went on the senior coach trips in the area, because she didn't drive, and she thought she needed to get out. The cost of the trip was only £12.50, which I thought was good value. Our guide talked some of the time, but not incessantly, as some do. That tends to get on my nerves. Once we arrived in Whitby, we were on our own, which suited me very well, as I could roam on my own and go where I pleased. 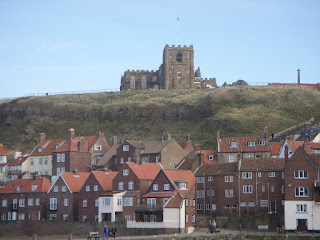 Andrew Teather, an Anglo-Catholic ordinand who is the mainstay of Anglican Wanderings, a North of England (with branches in Ohio and now in Calgary) AC blog which I visit, was in Whitby last week and is currently doing a series of posts on the town. A couple of days ago he downloaded an interesting, well-illustrated post on the old parish church up by the abbey. Lapin, St. Mary's is quite a church. Today, Teather writes about St. Ninian's, which I believed was an Orthodox church at first. The side chapel he pictures is lovely. Because of the blue color, I thought it was a Mary chapel. I visited another Anglican church in town, but I can't remember the name of it. It was built in the early 20th century. Perhaps, that's why Teather doesn't think it's significant. I'd love to spend more time in Whitby. WendyCarole, welcome. The fish and chips were excellent. Later I found out that I could have ordered a smaller plate, the luncheon special, which was not listed on the menu. St Hilda's I suspect, Mimi, which Andrew is planning to post today. Thank you for sharing your adventures (and photos) with us! Lapin, I confess that the churches are now running together in my mind. I remember the two that were near one another, St. Mary's and St. Hilda's, I suppose. I have a picture of the interior of St. Mary's, I believe, but it's dark and full of whiteish spots, and I can't fix it enough to look decent. HF, I'm pleased that you enjoy my wee travel accounts, although some of them are not so wee, but rather long-winded. I still have York Minster and the Cathedral of St. Nicholas in Newcastle, but I don't know when I'll get around to posting about them. And of course this is where I stayed with the nuns. DP, I know, I know. Must you rub it in? I'd like to have sneaked and been there with y'all and the nuns. And they didn't let you out to roam the town, did they? Wonderful pictures. I've always wanted to see Whitby after all the studying about the council there and Hilda, of course. 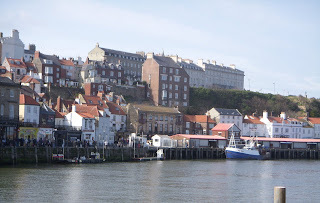 Anyone who goes to the north of England should include Whitby in the itinerary. I loved it. My favorite of my pictures is the waves rolling in. That's why it's at the top of the post. JCF, I'll make my best effort. David G., could be. I'd post the picture, but I'm no longer sure about which church it is. A little late to the party, but just to fill in the Whitby - Dracula connection; Bram Stoker was in Whitby to recuperate from illness. He was sitting in the grounds of the Abbey looking down onto the fishing boats unloading in the harbour below. The area is prone to both low-lying sea-mist rising from the water far below the Abbey, which can give the harbour a surreal, veiled look when viewed from above, and rather turbulent ground-mists atop the cliff which swirl around the gravestones and Abbey ruins; the combination, especially around sunset, give the place an eerie, haunted feel. He coupled this atmosphere with the legendary tales of smugglers caves that proliferate among the vasts tracts of desolate landscape around the North Yorkshire coast and decided that Whitby Harbour was the ideal place to have his vampyric Count come ashore. As it happpens, the N. Yorks coast is one of my favourite spots here in the UK, and I try to visit a least once a year. AofS, thanks for filling me in on the Dracula history. Whitby is a lovely place. I wished I'd had more time there.